ARE YOU still managing your projects on spreadsheets? Or spending hours on analysing time sheets? Well, you shouldn’t. There are several reasons why spreadsheets are bad for your business (and teamwork). When it comes to project management, the challenges are almost the same in every field – it doesn’t matter whether you’re working in the creative or professional services industry. When managing multiple projects and being in charge of accomplishing them, you need a trustworthy tool to bring structure to your work. And of course, we believe that project management in Scoro can help to improve your results. It has helped us and our clients [seeCase Studies] to get ahead in our sales, marketing, and product planning for years! Keep reading to find out how you can get more out of Scoro by using it for project management. How and where do you handle your projects? 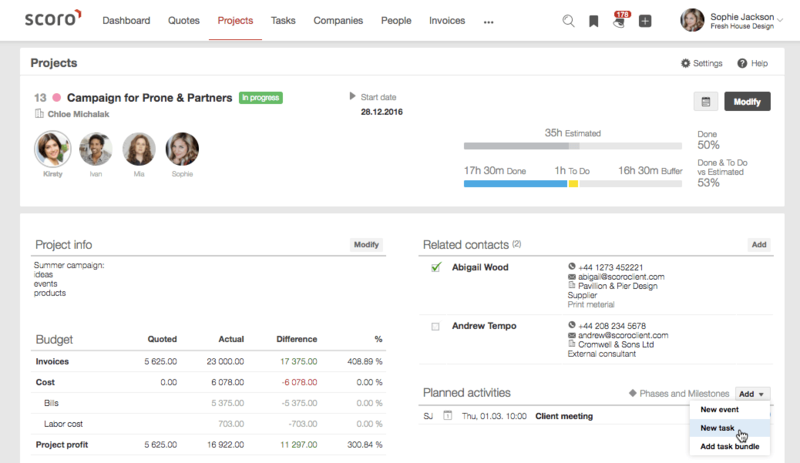 Are you satisfied with the level of organisation or would you like to have a better overview of each project, task, and hour? If you want to be in charge of your projects, you need a structured project management timeline to plan and track your work. You can find all the tools you need under Scoro’s Project features. How to create a project framework in Scoro? Let’s walk through the key steps of creating a structured project that’s well-planned and easily trackable throughout its life cycle. Before you create a project, you need people to whom you can assign and delegate tasks to. 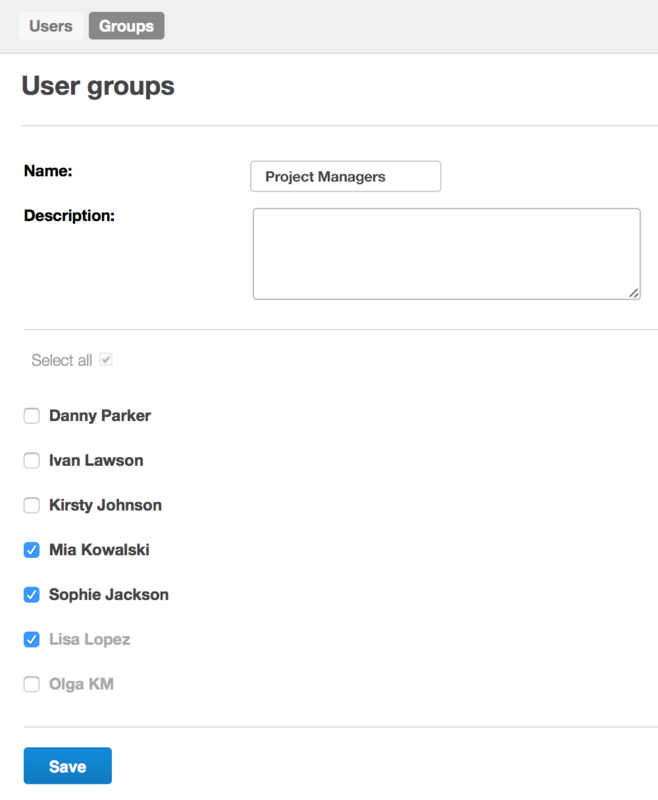 Create user groups with various administrative rights and add all your team members to Scoro. Now that you’ve created a team, it’s time to create the project. You can easily add a project in the Project list, or by clicking on the + icon on the header menu of your Scoro page. When creating the project, make sure to fill in all the relevant information and give the project a name. To add members to the project, click on the option Choose members. If you’d like only these members to have access to your project, make it a Members only type of project. And don’t forget to notify all the participants! A project without tasks is only half-done. To have a clear overview of everything that needs to be done, add your tasks to the project. To add tasks, you can go to the project view and add them, one by one. Or add a task from your Task list and just link the task with the relevant project. Tip: When saving, select the Save and add another button. That way, the current task is saved and a new task window is opened right away for you to add another. But this time, some fields (activity type, and relation with a person, company or project) are already filled in. You can also add new tasks by clicking on the + icon on the header menu of your Scoro page, and selecting New Task. 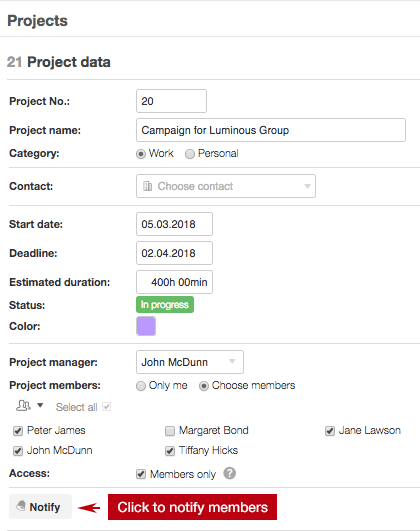 When creating the task, you can choose which project to link it to. Time entry is a sub-task that you can add under each primary project task. They’re great for logging your time and separating different activities under one task. If you’re working on a task that can’t be finished at once, you can log the time worked as time entries. Time entries also serve as a great tool for assigning parts of the same task to different people. You can add time entries by opening the task view and clicking on the Add button under Time entries. To assign the time entry to someone else, select the user. If the sub-task is yet to be completed, uncheck the Done box. Et voilá! You’ve set up a structured project framework. 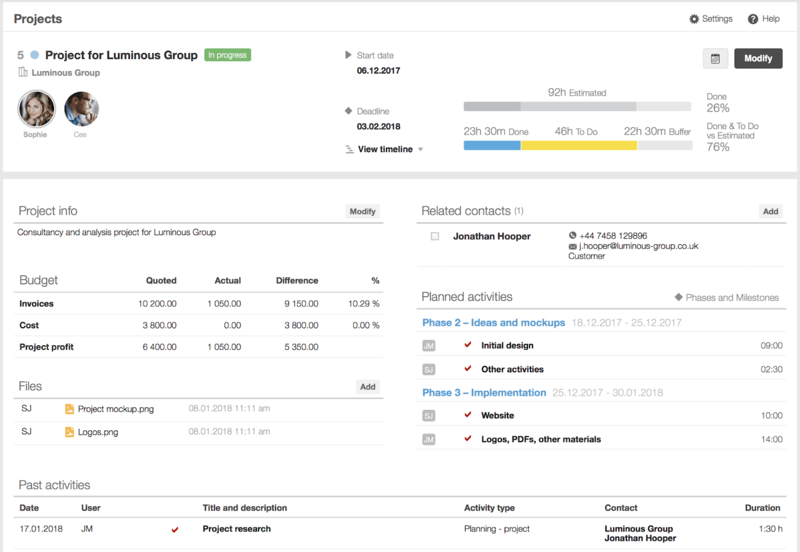 Organising your projects so that they’re easily trackable, and your team can collaborate more freely, is essential for project management success. Now that you’ve established the most important thing – a project framework – you can move on to applying small, yet effective hacks and tips. Do you know how and where your team’s time is spent? Would you like to have a clear overview of the most profitable projects and prioritise your tasks based on reliable data? Time tracking software can help you monitor your team’s achievements, increase productivity, and make information-based decisions. The fastest way to log your time with Scoro is by using time entries. We already explored this feature earlier, now it’s time to see how it works in action. There are multiple ways of creating new time entries and logging your work time in Scoro. The easiest way is to go to your Task list and click on the stopper icon after each task. As you click on the timer icon, a small window will pop up. You can insert the time spent on a task and hit Save so that the information will be added to your project, task, and work report. Tip: Noticed the $ sign? By clicking on it, you can also insert the billable time (to activate this function, first read all about work-time billing). Imagine how much easier it will be to bill your clients for your work later! You can also add your task lists as widgets to your dashboard. 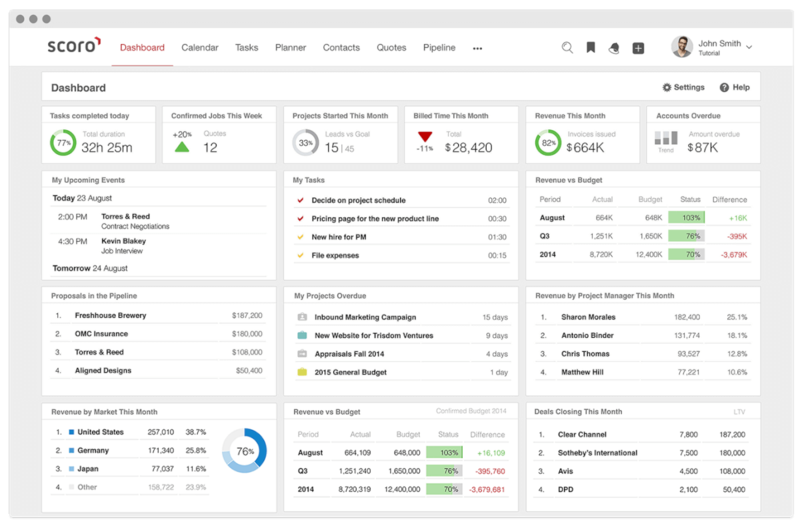 One reason teams use Scoro for project management is the project dashboard. You can add all your relevant business metrics and project KPIs to a single dashboard to have a quick overview of your project progress. If you like, you can create a new dashboard for each project and share these with different team members (as there’s no limit to the number of dashboards you can create) in Scoro. There are countless options of KPIs that you can add to Scoro project dashboard. IMPORTANT! Before you log in to Scoro and start creating project dashboards, you really need to see this guide to setting up the perfect dashboard. It’s quite essential to get a quick, yet thorough overview of your projects’ progress. In the project detailed view you get an overview of the project content, contacts, members, all related documents (like invoices, bills, etc.) and so on, but also project progress, budget and more. To give you an even more exact look into the future and help plan your project activities better, we’ve created the Phases and Milestones feature. Plus, the simplified version of a Gantt chart comprises multiple tasks and timelines into one visually clear table. Thanks to this feature, a project manager can easily see what the team members are working on, while also grasping how individual tasks come together toward project completion. As it allows to break down long-term projects into more manageable sets, it’s more likely you’re clear of overburdening your team members. With the help of the Project Timeline chart your team can spend less time on meetings, as status updates are visible right there in the chart. Structure your work better and track your team’s progress by setting the order of project phases in a logical timeline and adding different tasks under each phase. Set milestones to have a clear goal for each step of the project. Task management is the essential part of project management. Still, managers struggle to keep track of ALL the tasks and their completion. 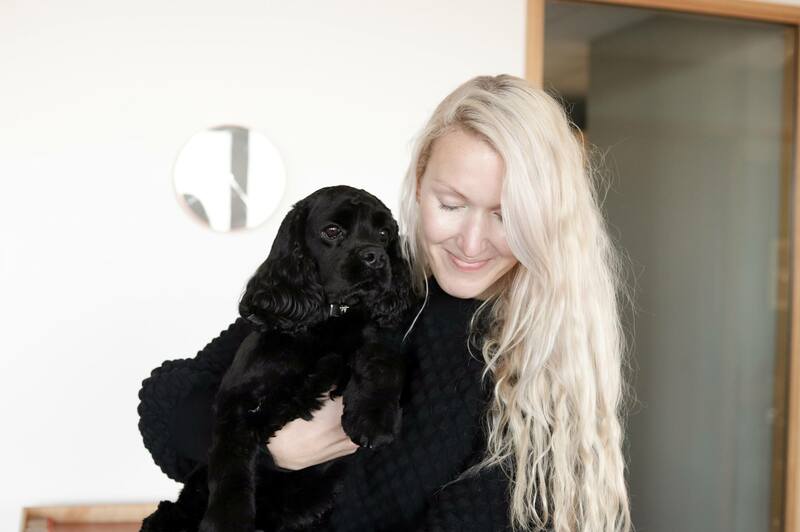 Do you need some help with managing your tasks? How can you tell when a task crosses its deadline? The easiest way is to go to your Task list and filter the list so that you see every team member’s overdue tasks. If you like to manage your tasks with statuses (planned, in progress, draft ready, completed, etc.) you should try Scoro task board. 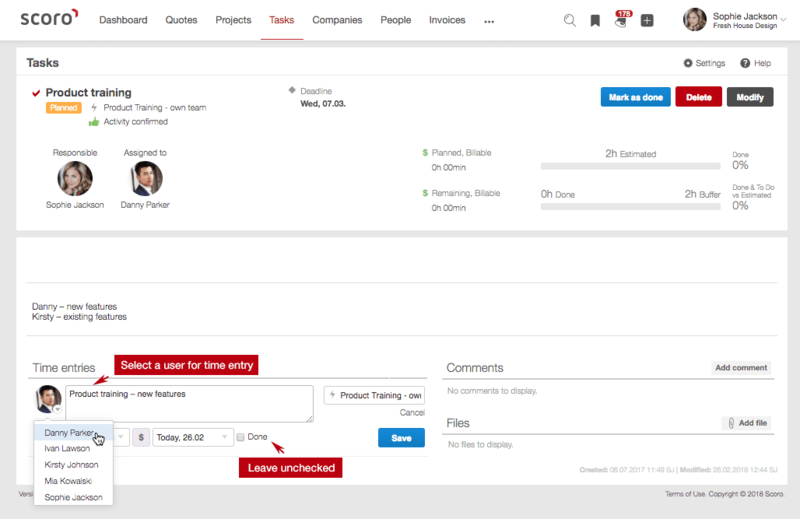 The task board resembles a sales pipeline management tool, only it’s used for efficient task management. You can find your task board under the Task list. The cool thing about the task board is that it can be grouped in many different ways: by priorities, activity types, projects, companies, statuses, users, and owners. You can drag and drop any task on your task board to change its status, priority, etc. 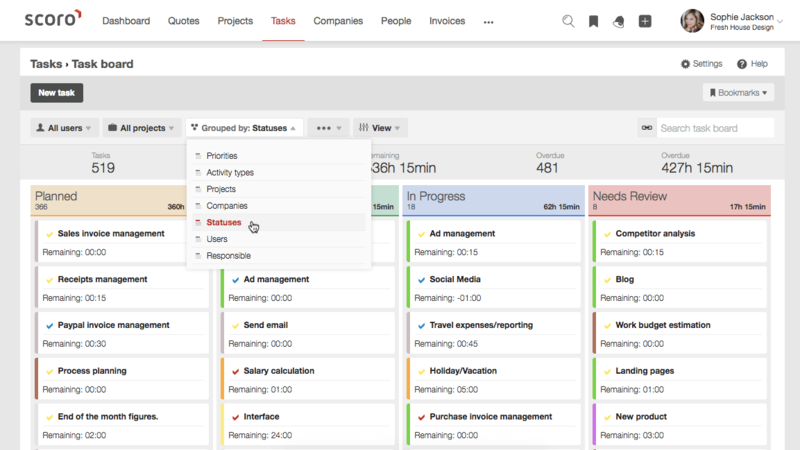 You can even filter your task board by team members (users) and drag-and-drop a task from one user to another. We’ve covered the essentials of project management in Scoro. If you have any questions, drop a comment, and we’ll answer as soon as humanly possible.